Forbes released its 31st annual ranking of the world's billionaires Monday. These are the five wealthiest individuals in 2017. Forbes.com has more. Bill Gates remains atop the list of the world's richest individuals with a personal fortune of $86 billion, following the unveiling of Forbes 31st annual rankings of the globe's billionaires. 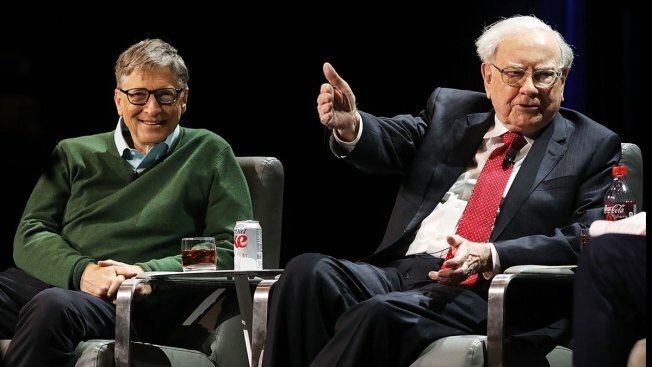 Joining Gates in the top three is investor/philanthropist Warren Buffet, with a net worth of $75.6 billion and Amazon CEO Jeff Bezos, the biggest gainer on the list, with a net worth of $72.8 billion. President Donald Trump comes in on the list at No. 544, with a net worth of $3.5 billion. This is a slight drop from the 2016 list where Trump's fortune was listed at $3.7 billion. Eight of the top 10 on the list hail from the United States. “Booming stock markets, higher commodities prices and plain old-fashioned entrepreneurship helped make this a record year in terms of wealth creation around the globe,” said Luisa Kroll and Kerry Dolan, Assistant Managing Editors of Wealth at Forbes Media, said in a press release announcing the list. 2,043 billionaires (up from 1,810 in 2016) made the list, with an average net worth of $3.75 billion. The change in the total number of billionaires – up 233 since last year – was the biggest increase in 31 years. The total combined net worth of this year’s billionaires was $7.67 trillion, up from $6.48 trillion last year. 1,371 members were self-made billionaires. 238 inherited their wealth; another 434 inherited at least a portion but are still growing it. Notable newcomers included Vietnam's first self-made woman billionaire, Nguyen Thi Phuong Thao, who took her budget airline, VietJet Air, public in February 2017. Also new to the list is Japan’s first self-made woman billionaire, Yoshiko Shinohara, who started a part-time staffing firm from her one-bedroom Tokyo apartment to help women get into the workforce. She debuts thanks to a 50% surge in the stock price of her company, Temp Holdings, in the past year. Other notable newcomers to the list include: Australian Manny Stul, whose toy company created the popular Shopkins collectibles; American Yvon Chouinard, the founder of outdoor gear maker Patagonia; and Juan Francisco Beckmann Vidal of Mexico, who is chairman of tequila maker Jose Cuervo.